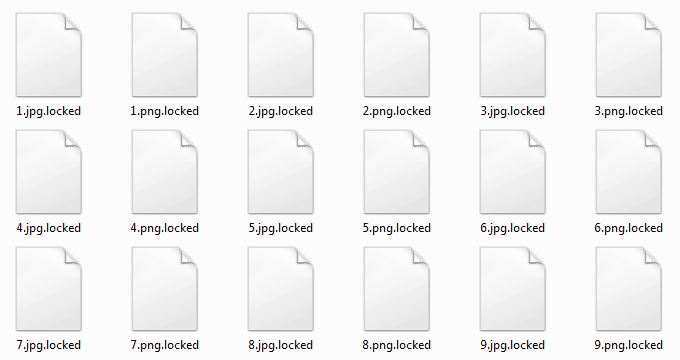 Learn how the little-known LockerGoga ransomware carries out its attack and be advised on the ways to restore files with the .locked extension grabbed hostage. Some samples of crypto ransomware are competently tailored programming-wise but hardly ever hit targets other than home PCs. Contrary to that, some are crude in terms of their code but attack multinational corporations that might pay a fortune to the criminals just to revert to normal operations. Whether or not this paradox is based on pure luck of the malefactors remains a mystery. The recent incident involving a strain documented as LockerGoga has exemplified such a discrepancy. It reportedly plagued the computer infrastructure of Altran, a France-based engineering consulting firm with offices in different parts of the globe. The raid, which took place in late January 2019, coerced the organization to shut down their IT network for quite some time. Upon expert inspection into the quandary, the LockerGoga ransomware that wrought so much havoc turned out to be a mediocre sample with hardly any progressive characteristics whatsoever. It is incredibly slow at encrypting data due to the fact that it creates a new process whenever a file is encoded. It employs the Rijndael cipher, more commonly known as AES (Advanced Encryption Standard) to lock down the victim’s information. Although the ransom note, which will be touched upon further down, mentions a mix of RSA-4096 and AES-256, that’s most likely bluff aimed at making the attack look scarier. Nevertheless, the relevant cryptosystem being symmetric and not the strongest across the board, it is still impossible to crack in the event of proper implementation. Unfortunately, this appears to be the case here. When a file is scrambled this way, it gets the new .locked extension appended to its name. So, if an image Meeting.png undergoes the adverse impact, it becomes Meeting.png.locked. As a byproduct of the incursion, the LockerGoga virus drops a document that gives the victim an idea of what has happened and provides recovery instructions. It’s named README-NOW.txt and it offers the user to verify what the crooks call “honest intensions” by sending them a couple of random files. In response, the extortionists will supposedly submit deciphered copies of these objects. The contact emails may vary in different scenarios. Some of the known ones include CottleAkela@protonmail.com, AbbsChevis@protonmail.com, QyavauZehyco1994@o2.pl, and IjuqodiSunovib98@o2.pl. The target is also told that the ransom is payable in Bitcoin, and the precise amount depends on the victim. If it’s a major organization, as in the Altran onslaught example, the buyout will obviously presuppose a bigger payment. The demands will be appropriately adjusted for a single user whose PC happens to be polluted. One of the quirks of the LockerGoga ransomware that might play into victims’ hands is that the offending code may neglect the phase where Shadow Copies of the data are erased. It means there may be a good chance to restore the information using commonplace data forensics. Another noteworthy trait of this pest is that its payload had a valid digital certificate in the early attacks. This allowed the malicious binary to slip under the radar of many security solutions. The cert has since been revoked, though. To wrap up, the LockerGoga outbreak shows that even an unskilled adversary can cause a lot of damage, no matter how immature the ransomware code is. If the incursion has taken place, the following techniques may allow for reinstating data without satisfying the felons’ demands. 2. Rest assured the scan report will list all items that may harm your operating system. Select the detected entries and click Fix Threats to get the troubleshooting completed. 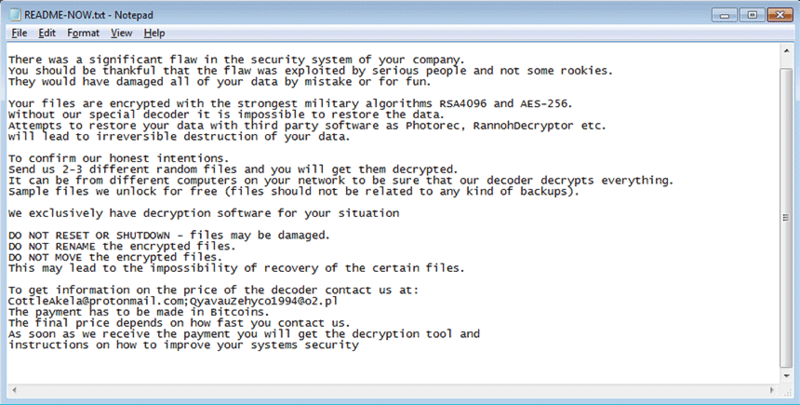 Some strains of ransomware are known to delete the original files after the encryption routine has been completed. As hostile as this activity appears, it can play into your hands. There are applications designed to revive the information that was obliterated because of malfunctioning hardware or due to accidental removal. The tool called Data Recovery Pro by ParetoLogic features this type of capability therefore it can be applied in ransom attack scenarios to at least get the most important files back. So download and install the program, run a scan and let it do its job. Some ransomware strains terminate themselves after completing the encryption job on a computer, but some don’t. Furthermore, the LockerGoga blackmail virus may prevent victims from using popular antimalware tools in order to stay on board for as long as possible. Under the circumstances, it may be necessary to utilize the Safe Mode with Networking or System Restore functionality. 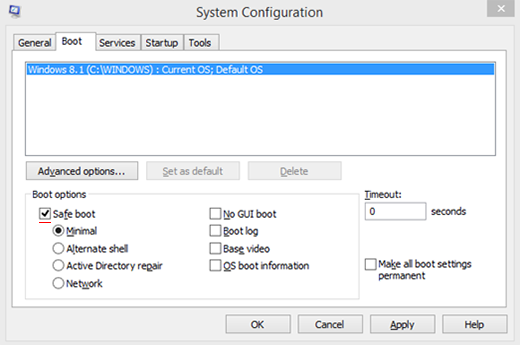 Boot into Safe Mode with Networking. The method to do it depends on the version of the infected operating system. Follow the instructions below for your OS build. Restart the machine. When the system begins loading back up, keep pressing the F8 key with short intervals. The Windows Advanced Options Menu (Advanced Boot Options) screen will appear. 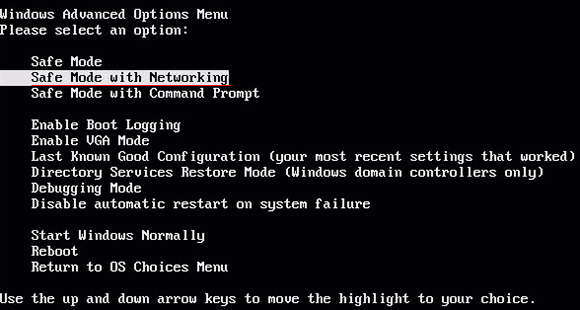 Use arrow keys to select Safe Mode with Networking and hit Enter. Log on with the user account infected by the ransomware. Click on the Search icon next to the Start menu button. Type msconfig in the search field and select the System Configuration option in the results. Go to the Boot tab in the upper part of the GUI. Under Boot options, select Safe boot and click the Apply button. A prompt will appear to reboot the computer so that the changes take effect. Select the Restart option and wait for the system to load into Safe Mode. Again, log on with the ransomware-stricken user account. In Safe Mode, the ransom Trojan won’t keep security software from running or otherwise thwart troubleshooting. 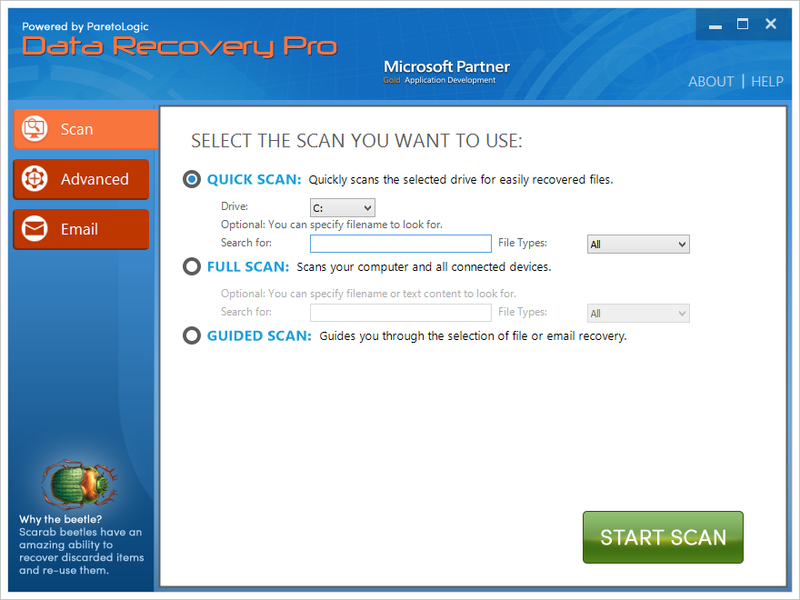 Open your preferred web browser, download and install an antimalware tool of choice and start a full system scan. Have all the detected ransomware components removed in a hassle-free way. 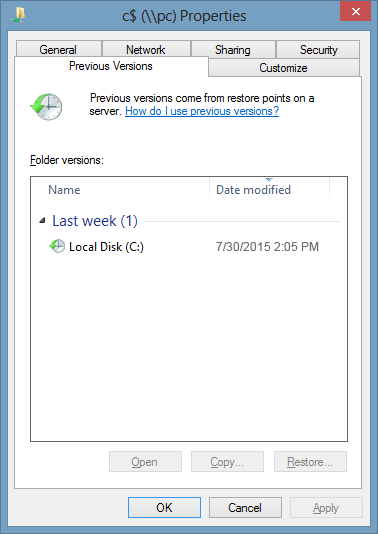 System Restore enables Windows users to roll back all changes made to the OS since the latest restore point creation time. This feature can help eliminate the most persistent ransomware. Before going this route, though, make sure System Restore had been enabled prior to the breach, otherwise the method will be inefficient. Open Windows Advanced Options Menu as described in the previous section: hit F8 repeatedly when the PC is starting up. Use arrow keys to highlight the Safe Mode with Command Prompt entry. Hit Enter. 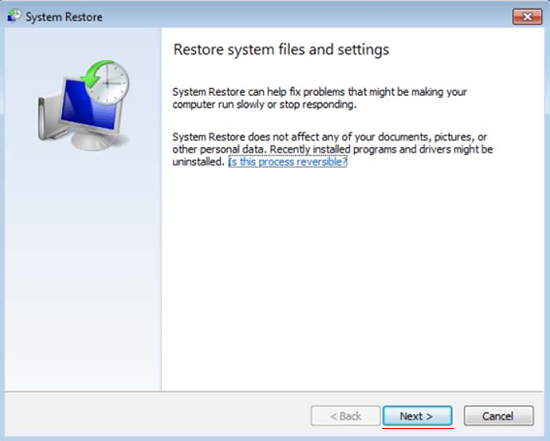 When the System Restore screen pops up, click Next, select a restore point that predates the contamination, and use the application’s controls to roll back the system to this earlier state. Be advised that even after the ransomware is removed, files will still be encrypted and inaccessible. The malicious code cleanup part, however, is important because it keeps a relapse of the infection from occurring further on and eliminates all opportunistic malware. Cracking the crypto used by this ransom Trojan is more of a science fiction thing rather than an attainable prospect for the masses. This is why the troubleshooting in predicaments of this sort is a matter of two approaches: one is to pay the ransom, which isn’t an option for many victims; and the other is to apply instruments that take advantage of the ransomware’s possible weaknesses. If the latter is your pick, the advice below is a must-try. Not only are you a lucky person in case you’ve been backing up your most important files, but you’re also a wise and prudent user. This isn’t necessarily a resource-heavy activity these days – in fact, some providers of online services are allocating a sufficient size of cloud storage space for free so that every customer can easily upload their critical data without paying a penny. Having removed the LockerGoga ransomware, therefore, all you have to do is download your stuff from the remote server or transfer it all from an external piece of hardware if that’s the case. A positive upshot of using this technique depends on whether or not the ransomware has erased the Volume Shadow Copies of the files on your PC. This is a Windows feature that automatically makes and keeps the backups of data elements on the hard drive as long as System Restore is enabled. The cryptoware in question is programmed to switch off the Volume Shadow Copy Service (VSS), but it has reportedly failed to in some cases. 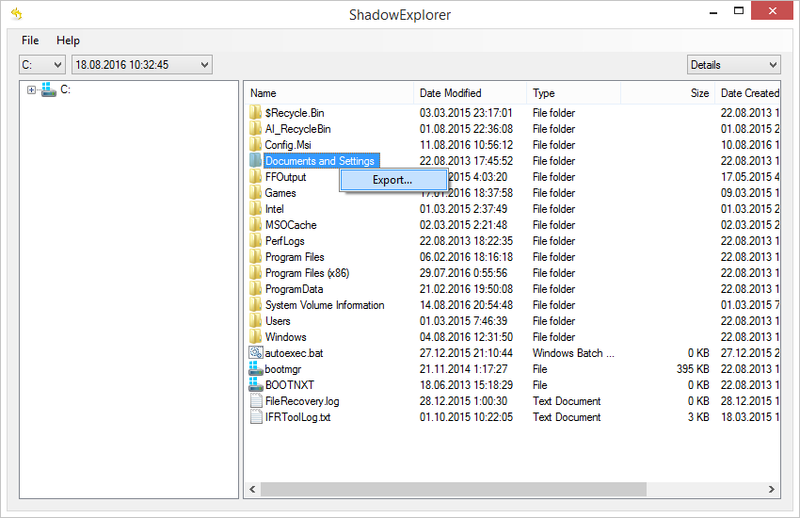 Checking one’s options regarding this workaround is doable in two ways: through the Properties menu of each file or by means of the remarkable open-source tool called Shadow Explorer. We recommend the software-based way because it’s automated, hence faster and easier. Just install the app and use its intuitive controls to get previous versions of the encrypted objects reinstated. Alternatively, you can leverage the Previous Versions feature, which is native to Windows operating system. This method is more cumbersome that the use of ShadowExplorer, but it can help restore the most important individual files on condition that the ransomware failed to disable the Volume Snapshot Service on the computer. Right-click on a file of choice and select Properties. Then, go to the Previous Versions tab as illustrated below. Go ahead and pick the file’s latest backup version on the list. Use the Copy or Restore buttons to reinstate this object to a new path or to its original folder, respectively. Use an effective antimalware suite. There are security tools that identify ransomware-specific behavior and block the infection before it can do any harm. These techniques are certainly not a cure-all, but they will add an extra layer of ransomware protection to your security setup. Post-factum assessment of the accuracy component in malware removal scenarios is a great habit that prevents the comeback of harmful code or replication of its unattended fractions. Make sure you are good to go by running an additional safety checkup.